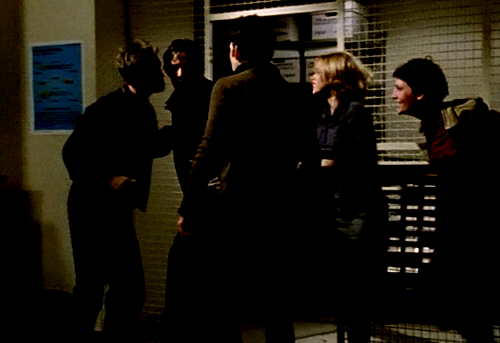 Behold, Xander gets sniffed by some kids he didn't used to like: I'm back for "The Pack"! Wait, time out. The library has a hyena section? And still nobody brings up matriarchal pack structure? 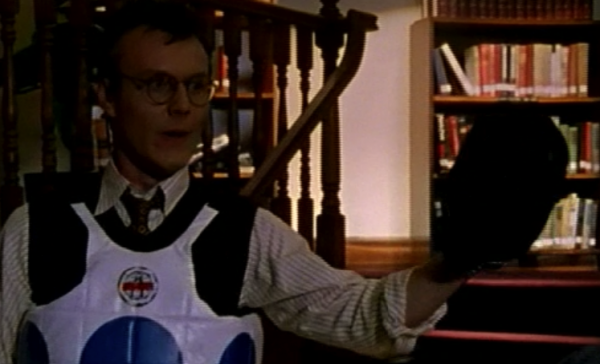 Giles and Objects: I didn't find any good screencaps of him holding anything, but here he is wearing something funny. Since I know there's a sombrero and a wizard hat in his future, maybe the "Giles and Objects" section should encompass his wardrobe as well. • The shooting script says the zookeeper is dressed like Marlin Perkins. I just want you all to know that I have no idea who Marlin Perkins is. • I can't think of any other notes, I don't have the episode open anymore. • Hyenas, right? Lol hyenas.